This document provides the steps and workflow to create a .NET Core solution for macOS. Learn how to create projects, unit tests, use the debugging tools, and incorporate third-party libraries via NuGet. This article uses Visual Studio Code on macOS. Install Visual Studio Code. During the course of this article, you also install Visual Studio Code extensions that improve the .NET Core development experience. Install the Visual Studio Code C# extension by opening Visual Studio Code and pressing F1 to open the Visual Studio Code palette. Type ext install to see the list of extensions. Select the C# extension. Restart Visual Studio Code to activate the extension. For more information, see the Visual Studio Code C# Extension documentation. In this tutorial, you create three projects: a library project, tests for that library project, and a console application that makes use of the library. You can view or download the source for this topic at the dotnet/samples repository on GitHub. For download instructions, see Samples and Tutorials. Start Visual Studio Code. Press Ctrl+` (the backquote or backtick character) or select View > Integrated Terminal from the menu to open an embedded terminal in Visual Studio Code. You can still open an external shell with the Explorer Open in Command Prompt command (Open in Terminal on Mac or Linux) if you prefer to work outside of Visual Studio Code. The Thing class contains one public method, Get, which returns the sum of two numbers but does so by converting the sum into a string and then deserializing it into an integer. This makes use of a number of modern C# features, such as using static directives, expression-bodied members, and string interpolation. Note that you assert the value 42 is not equal to 19+23 (or 42) when you first create the unit test (Assert.NotEqual), which will fail. An important step in building unit tests is to create the test to fail once first to confirm its logic. These commands will recursively find all projects to restore dependencies, build them, and activate the xUnit test runner to run the tests. The single test fails, as you expect. The console app you create over the following steps takes a dependency on the library project you created earlier and calls its library method when it runs. Using this pattern of development, you see how to create reusable libraries for multiple projects. Execute the following dotnet run command to run the executable, where the -p option to dotnet run specifies the project for the main application. The app produces the string "The answer is 42". Set a breakpoint at the WriteLine statement in the Main method. Do this by either pressing the F9 key when the cursor is over the WriteLine line or by clicking the mouse in the left margin on the line where you want to set the breakpoint. A red circle will appear in the margin next to the line of code. When the breakpoint is reached, code execution will stop before the breakpoint line is executed. 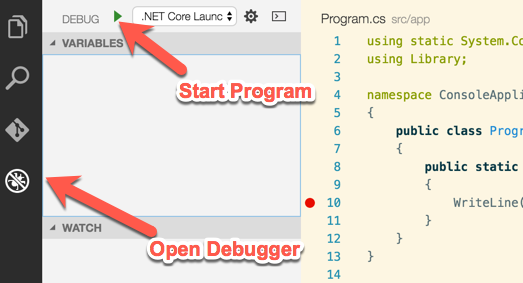 Press the Play button to start the application under the debugger. The app begins execution and runs to the breakpoint, where it stops. Step into the Get method and make sure that you have passed in the correct arguments. Confirm that the answer is 42.